Victoria Carpets have just released three new carpet ranges: Sayan Peak, Dahan Khan and Mount Yala. Each of the ranges are available in the same 6 neutral and contemporary colourways. Made of 100% wool (20% is Yak Wool) in 4M width, each range is a different style of textured loop pile carpet. To view the collection please make an appointment to come visit our showroom. 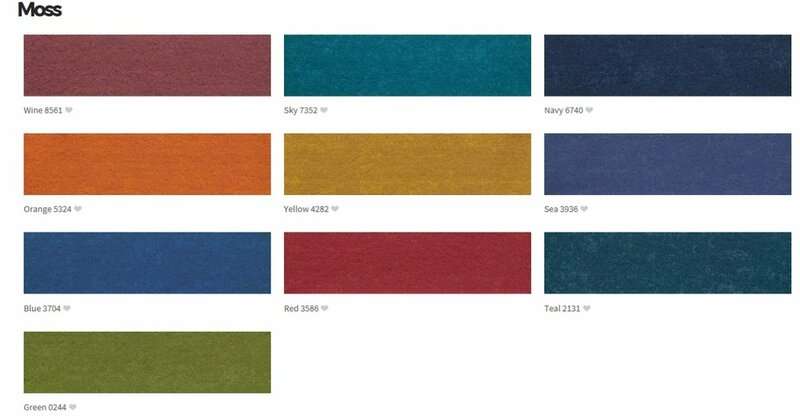 Discover a new world of colour with this exciting range of commercial flooring from Polyflor. Inspired by the natural environment and a world of colour, this high performance heavy duty homogeneous flooring has been designed to bring style and elegance to commercial settings. It is ideally suited to high traffic environments such as Healthcare, Educational, Commercial and Retail outlets. Cushionstone is a new range from Kenbrock that delivers the beauty and look of natural stone and ceramics without the disadvantages associated with them such as cost, coldness and installation and removal hassles. Cushionstone is a range of Modular LVT flooring. It comes in large 600mm x 600mm tiles for a no fuss installation and easy repairs. Fibreglass reinforcement layer for maximum stability. Heavy wear layer providing excellent durability and the PUR surface treatment that minimises maintenance for busy people. Comfortable to walk on, less sound transfer, won’t crack or chip and easy to replace if and when needed, Cushionstone is an ideal alternative for those people looking for an affordable floor without compromising on looks. Introducing a new carpet from Signature Floors called Coco. Coco is a “fashionable, french style” loop carpet made of 100% undyed wool. It is extremely luxurious with its 80oz density and large loop construction. Available in 6 neutral shades. Introducing Hybrid from Godfrey Hirst. 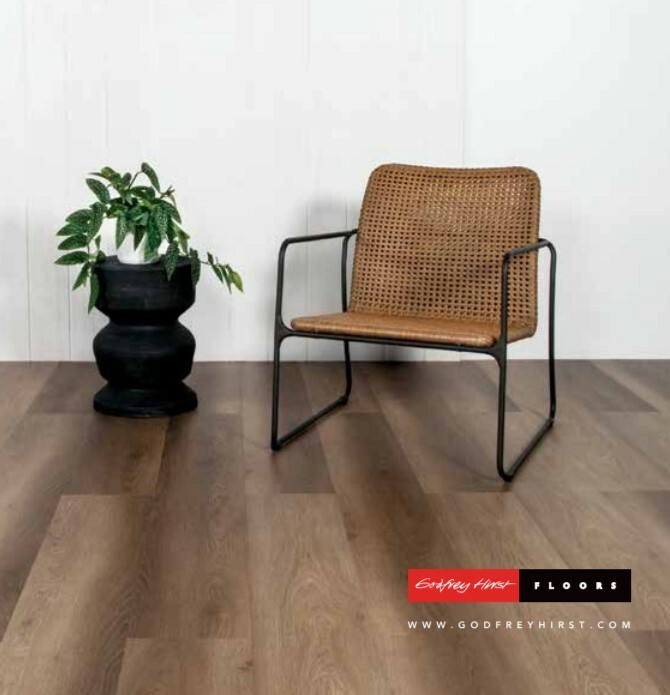 This new innovative product features Godfrey Hirst cutting edge technology to create flooring with the visual appeal of timber but with the best attributes of laminate and vinyl. Fade, stain and wear resistant and suitable for wet areas such as laundries and bathrooms. There are a number of different hybrid ranges, one of which is Aurora which comes in 12 different natural colour options. If you are looking for a chunky loop pile carpet, then Himalaya carpet's Apollo range could be just the answer. There is a nice selection of neutral colours which would look great in both modern or classic homes. Apollo comes in 4M wide and is made up of 60% Wool, 20% Yak Hair and 20% Polyester. Himalaya Carpets use only high quality wool and other natural products such as Yak hair as well as 100% recycled polyester fibre to create some of the most environmentally responsible carpets available in the market today. Introducing the stunning new Abode range of timber from Signature Floors. Sun-proof, fade-proof and water-proof....this range is the ideal choice for Australian homes. Available in two options - Abode Classic and Abode Wideboard. Abode Classic features 5 native Australian designs and comes in 176mm x 1813mm boards. Abode Wideboard features 6 timeless oak designs and comes in 223mm x 1813mm boards. Make an appointment at allfloors to view this stunning collection. It has been 30 years since Gary & Glenise Travaglia first started in the flooring industry! From their original store, which they opened in Swan Hill in 1987 to the existing store here in Carnegie today, they have created a thriving family business which they are still a part of. They have been joined along the way by their son, Jarrod and daughter, Jodie, both of whom were very young when the business was first established. They have seen plenty of changes in the flooring industry over the years and have implemented many industry firsts and we look forward to seeing what the next 30 years brings. Congratulations to Gary & Glenise from all the rest of us here at allfloors. We are very excited about a new range of carpet tiles from Signature Floors. Called the Botanica range this new collection of plank tiles are fun and fresh and are sure to be a go to for designers looking to create a bright and impressive floor design in commercial projects. Inspired by nature and the colours of tropical flora, the collection has two patterns to choose from - Stone and Bark, with three neutral tonal variants - Cloud, Storm and Midnight. These mixed with a comprehensive array of colours allow you to design a pattern and colour scheme to truly impress. If you are looking for a premium quality residential carpet in either a contemporary or classic colour then look no further than Supertuft's Escape Velour and Escape Twist carpet ranges. These plush and twist carpet ranges are made of 100% wool in a 50oz weight and are available in 29 colours, ideal for anyone looking to add some colour to their home away from the standard creams and greys. The range includes some gorgeous blues, greens, reds and purples, all of which can look stunning in the right room. We particularly love some of the blues in this collection. You just need to be brave enough to choose one! We have just received the samples of two new carpet ranges now available from two of our suppliers. Samurai from Cavalier Bremworth is a chunky loop pile carpet, available in 7 colours and made of 100% New Zealand Wool. To come in and visit us to view this range please make an appointment. Elegant Expression is a new range from Godfrey Hirst. This heavy Solution Dyed Nylon cut pile twist is soft and luxurious and comes in eight colour choices. Make an appointment to come in and see this range. Introducing Salisbury, a new carpet from Feltex. This 100% wool chunky loop is so soft and textured that it is sure to appeal to our client base looking for a classic neutral colour that complements rustic styling. Salisbury is a high-low loop pile and is available in seven colours. You can view this collection at allfloors carpet gallery, just contact us to make an appointment. allfloors are excited to announce that we are now stocking a range of engineered pre-finished oak timber flooring. We have just updated our showroom display to showcase 4 of these timbers on both the floor and walls and they look stunning! We have installed our display using both floating and direct stick methods to allow you to see and feel the difference between the two installation methods. One of the ranges we are stocking is Regal Oak from Godfrey Hirst. This is a range of handcrafted timber perfect for achieving a rustic look with it's round edges and distressed matte finish. The colours are smoked rather than stained to provide a consistent colour all the way through the hardwood top and we love the resulting matte finish. We are also stocking the G5 Luxury Oak range from Embelton Flooring. This is an exquisite collection of the finest grade European oak which has been wirebrushed to enhance the natural oak grain. 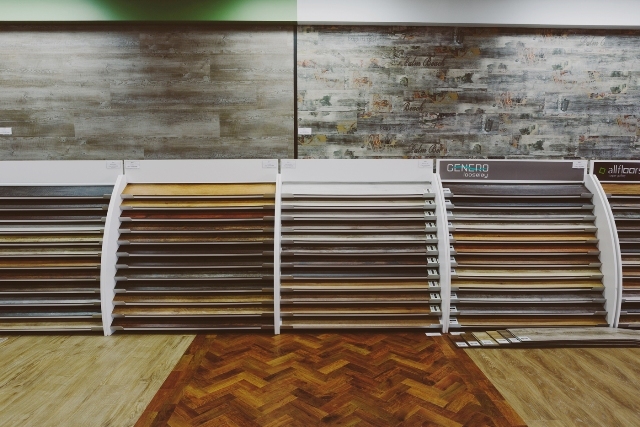 Another of our timber ranges is Dunlop Flooring, Heartridge. This range of hardwood timber floors is equipped with a tongue and groove join for the most secure and reliable installation achievable and are coated with a UV matte finish to preserve the natural look of the timber. And finally, we are stocking MJS Floorcoverings hardwood flooring range. This range of engineered timber flooring will add warmth, elegance and sophistication to your home. With a number of different options available you can choose to embrace tradition, add charm and beauty or express your love of nature. 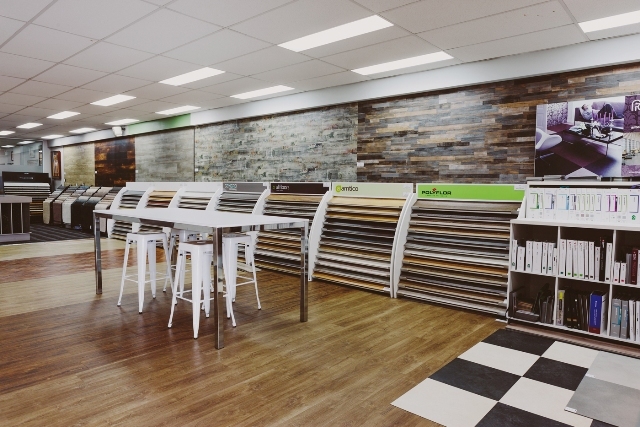 Make an appointment to come visit us and see our full range of timber flooring. The Temuka collection is an exclusive carpet range from Himalaya carpets. There are four new ranges now available at allfloors - Ashbury, Marinor, Timaru and Totera. Made of 100% Wool, this collection is an environmentally sustainable flooring choice that will bring natural beauty and warmth to your home. Featuring contemporary loop textures in six neutral colour tones, there is sure to be a carpet to compliment any decor. Each carpet comes 4m wide to lessen the need for seams. You can view this collection at allfloors, just make an appointment to come in and see us. Why not think outside the box and create different looks and textures on your walls using quality vinyl. Perfect for feature walls, kitchen splash backs or break out areas. Here at allfloors, we have talented installers who can create that something special for your next project. Make an appointment to come into our showroom and see examples of just how stunning wall vinyl can be. Image above was taken on a Commercial job we did in Spencer Street, Melbourne and is a great example of using vinyl to create a feature wall in a commercial environment. The images above are of our showroom where we have installed a selection of different wall vinyls to show you how you can create different feature walls in your home, business or office. A great way to turn your staircase into a feature. Stair runners can be made using the same carpet as the rest of your house or by using a pattern or feature carpet to really highlight the area. Binding can be a discreet hidden edging or a feature using a thick fabric in a contrasting colour. You choose your carpet and binding and we then send this to the rug binders for you to get made into a runner. Once ready we send our installer out to fit it for you. So make an appointment to see Jodie to discuss making the perfect stair runner for your house. Using the correct Vacuum is essential to keeping your carpet looking like new. It is absolutely vital that a vacuum cleaner with a power head is used for all plush pile carpets, without this the vacuum will not be sufficient to: (a) remove the loose dirt that has made its way into the pile (b) bring the cut pile back to its upright position. The preferred type are the upright models such as a Dyson, Karcher and it must have a separate motor driving the turbo head as opposed to the suction based types. The ducted vacuum systems without a power head attachment will not work under any circumstances, most ducted vacuum cleaner suppliers offer turbo head attachments, however these do not have a separate motor to drive the power head, they rely totally on the suction to function. If the motor in the system is not strong enough it will not provide sufficient power to the attachment to function adequately . We have formed the view that it is not worth going to the expense of purchasing the top of the range in these systems and then purchasing an attachment which is still only power driven. We advise our clients to use the ducted system for the hard floors and purchase a decent vacuum cleaner such as a Dyson or Karcher with a power head driven by separate motor, not suction driven for their carpet areas. These are approximately $700 – $800 which is far less than you would spend on an upgraded ducted system and an attachment. So you have your gorgeous new carpet installed, now you are wondering how you go about keeping it looking so good? At least once weekly thorough vacuum using a vacuum with a rotating power head with its own motor. Never rubbing, brushing or massaging the carpe t pile, especially when wet or damp. What is permanent pile reversal shading? All cut pile carpets, particularly ‘plush pile’ carpet may develop lighter or darker patches over time. Known as ‘shading’ or ‘watermarking’ it is caused by the permanent bending of the carpet pile fibres which then reflect he light differently. In this respect it is very comparable to other natural fibres such as velvet or suede. The extent to which shading occurs cannot be accurately predicated or prevented and is most often related to the location of use. Brushing, vacuuming or shampooing does not reduce shading. Shading does not affect the wear or durability of the carpet and is not recognised as a manufacturing flaw or defect nor is it covered by any manufacturing warranties.